Gemini Injection molded Slotted letters offer a flat sign letter face and sharp letter edges. These slotted letters (formerly listed as Slotted B sign letters) feature angled slots in the back of the letter returns (edges) which allow the letter to install easily and remain in place onto our Gemini Slotted track or Wagner Slotted track. Gemini Injection Molded changeable Slotted letters with flat faces and sharp letter edges. These sign letters are very popular with use on sign systems at theaters and other such large outdoor sign letterboard systems. 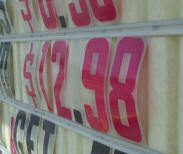 Replacement Thermoformed plastic "Slotted A" sign letters are still available on special request. The slotted A letters are essentially SnapLok letters with angled slots instead of metal tabs. The slotted A replacement sign letters must be custom quoted, and some replacements may not be available in small quantities. These slotted plastic letters (formerly listed as Slotted B letters) feature angled slots in the back of the letter returns (edges) which allow it to install easily and remain in place onto Sign Board systems using our Gemini Slotted track or Zip Wagner Slotted track. We also provide custom Flat Plastic letters which are produced using high powered laser cutting equipment in an assortment of acrylic thicknesses. Sign letters produced with this laser cutting technology provide a finished ( polished ) edge on the plastic sign letters. 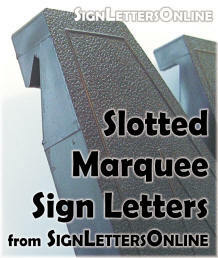 Some sign letter styles or logos can only be produced using laser cutting due to complex designs or small letter size. Laser cut flat plastic sign letters can be added to your interior or exterior building signage project by applying the letters using one of several mounting methods to choose from. 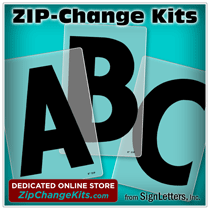 We provide flat plastic sign letters in an almost unlimited assortment of colors (including plastic letter colors and painted plastic colors) to satisfy even the most picky designers and architects. We provide the changeable sign letters used on many other high quality sign systems ( Gemini Pronto letters and Wagner Zip-Change ) and we also supply the cheap plastic replacement sign letters for the portable type sign units which are fairly common.